A new apartment project only a three-minute walk from the Kolbenova metro station will convince you. This is practical and affordable housing for singles, seniors and young families near a Metro B line station. You can either take the Metro or tram number 16 to get you quickly and comfortably to the centre of Prague. 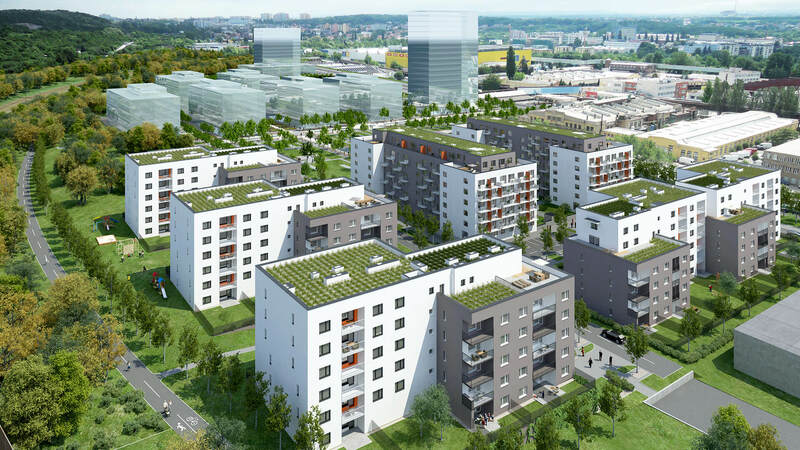 A former industrial area which for many years contained the extensive ČKD site is being transformed into a quarter with apartment buildings and offices with underground garages and other services providing full civic amenities thanks to the international developer group AFI EUROPE. There is a cycle path, the Brumbambule indoor children’s play centre and the unique Freestyle Kolbenka sports centre in close vicinity. Besides their affordable prices, you will be surprised by the more than 500 m2 trampoline park and the sloping surfaces designed to teach dry skiing and snowboarding. The Fénix Vysočanská shopping centre containing a BILLA supermarket and a network of further shops and services is located one metro station away or a 3-minute tram journey from the future Tulipa City quarter. This includes the brick and mortar branches of ČSOB, KB and UniCredit Banka, several cash machines and the essential pharmacy and post office. Don’t miss this good investment in a place that has huge further development potential in the next five to ten years. In our project we have prepared an interesting new feature in the shape of a room situated in the underground area for washing bicycles. We believe that this new facility will provide a pleasant above-standard service which will be appreciated by future residents.